(British Library, 2010) x + 197 pp. Reviewed by Michael Slater on 2011-03-29. A number of books have been written about that phenomenon of Victorian magazine publishing, the comic weekly journal Punch, which was begun in 1841 and was destined to survive for a century and a half. Notable studies of it include M.H. Spielmann's monumental The History of "Punch" (1895) and, more recently, the late Richard D. Altick's richly detailed Punch. The Lively Years of a British Institution (1997). Both these books concentrated on the biographical background of the contributors and on the contents of the journals, on Punch as text. Patrick Leary is more concerned with the history of the magazine as a collaborative business enterprise and with its history in this respect from its beginnings to the death of its second editor, Shirley Brooks, in 1874. Leary explores the central role that oral culture, mainly in the form of "table talk," played in creating the "collaborative dynamic" that drove everything connected with the journal. His study is founded on two major manuscript sources, both of them diaries. The first was kept by Henry Silver, who replaced Douglas Jerrold on the permanent staff of Punch in 1858. For the next twelve years, with one or two gaps, this shy, retiring man took detailed notes of the tumultuous, frequently scandal-mongering and bawdy discussions of contemporary events and personalities that took place every Wednesday evening in the course of a highly convivial dinner given by the magazine's proprietors and publishers-- William Bradbury and Frederick Mullett Evans-- to Punch's editors (Mark Lemon until 1870 and then Shirley Brooks) and the remarkable team of writers and artists who were salaried "staffers" on the magazine. Silver's diaries, now in the British Library, have often been mined by historians of Punch; Silver himself furnished Spielmann with tidied-up and bowdlerised material excerpted from the diaries, and R.G.G. Price quoted extensively from them in his popular A History of Punch (1957). But Leary also mines a diary kept by the up-to-now utterly forgotten Shirley Brooks, vividly evoked as not only an "indefatigable Tory journalist" (131) and hugely prolific writer in many different genres but also a "clubman, diner-out, paterfamilias, and lionized wit" (128) who unflaggingly strove to help all struggling fellow-writers and artists. Leary uses both of these diaries to retell the story of Punch. By stressing domestic life and avoiding the scurrility hitherto flaunted by satirical journalism, it came to permeate the very texture and rhythm of British middle-class life. The financial stability provided for the enterprise by the printing firm of Bradbury and Evans was also crucial for the magazine's survival and, above all, the exclusivity, solidarity, and sociability of the Punch "brotherhood" made the thing work. The brotherhood was strongly fostered by talk, especially at the Wednesday evening dinners, and Leary shows how successful this fraternity was in surviving the loss of major figures such as Jerrold, John Leech, and Thackeray. Silver's diary, he remarks, provides us with some very rare evidence of the way "middle-class men actually talked with one another in private, all-male settings in the mid-Victorian period" (29), so it is a major document for any study of 19th century oral culture. The main business of the Wednesday dinners was to decide on the subject for the "big cut" (full-page cartoon) of each weekly issue. 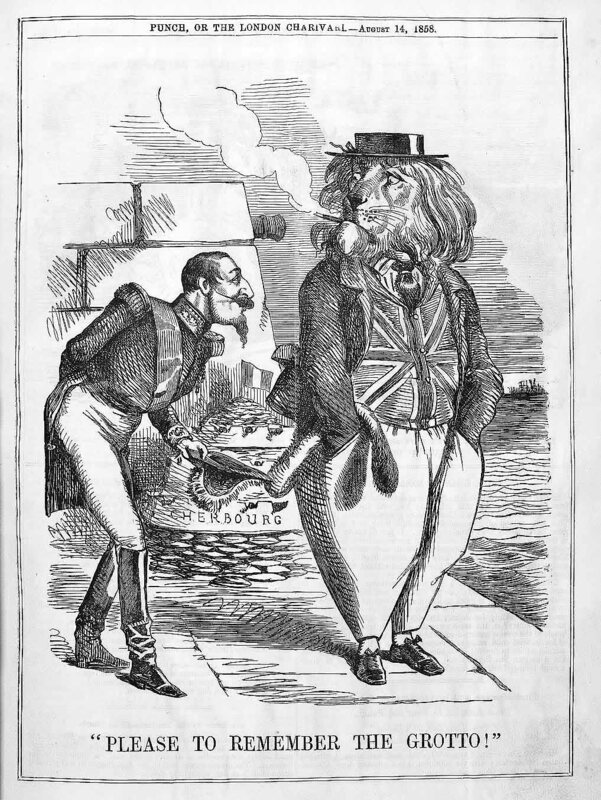 Drawn by Leech and, after his death, by Tenniel, the big cut was Punch's comment on some major contemporary political or social issue or event that that was making headlines in that particular week. It would be born from discussion that was sometimes sharply disputatious, but as finally published it presented itself as the view of a "single univocal agent, Mr Punch" (37), rather as a Times leader presents itself not just as the view of the editor or of a particular leader-writer but of the paper as a whole. Silver's diaries provide unique and invaluable testimony as to how these debates were resolved and the topic of that week's big cut decided on. As Leary shows, Punch table talk echoed the voices of many different London communities to which various members of the brotherhood belonged -- the theatre, Parliament, club-land, and so on -- as well as voices in the street. Fascinatingly enough, one of the latter found its way into a big cut published on 14 August 1858, when Napoleon III was shown holding his hat out to the British lion and saying "Please to remember the grotto!" (54). In exhibiting his new built harbour-works at Cherbourg, which were being honoured by a visit from Queen Victoria, the French Emperor is likened to children begging half-pennies from passers-by after constructing little ornamental grottos out of oyster-shells at the beginning of the oyster season. The mid-nineteenth century table-talk of Punch men also reflected the growing public fascination with the private lives of celebrities. For some time, as Leary shows, Punch men were virtually obsessed by the scandalous figure of Swinburne, the most talked-about newcomer on the literary scene in the 1860s. (Silver noted down the comments round the dinner-table: "More musical than Tennyson. But what a brute! Foul of tongue and foul of thought and foul of act. Lives with Mencken [the notorious equestrian actress Adah Mencken] in impotent filthiness" [qtd. 71]). By this time also the Punch coterie cherished their middle-class respectability as salaried professionals and sought to distance themselves from the so-called "Bohemians," the "educated but impecunious young writers for periodicals" exemplified by the rumbustious George Augustus Sala, whom Lemon banned from Punch despite his obvious talents (72). Bohemians were not particularly clubbable. When another young Bohemian named Edmund Yates published a profile of Thackeray that included reports of his private conversations in the Garrick, a famous quarrel -- the "Garrick Club Affair" -- broke out between Thackeray and Dickens. Thackeray's complaints to the Club's committee caused the expulsion of Yates from membership even though he was strongly defended by Dickens, who was also a member. When Dickens himself then resigned, he and Thackeray ceased to be on speaking terms for six years, until just before Thackeray's sudden death. In a chapter titled "Town Talk: Dickens, Thackeray and the Policing of Gossip," Leary manages to shed some new light on this much-discussed episode. Besides revealing that even before this affair the Garrick fretted about the recycling of Club talk in magazine or newspaper gossip columns, Leary corrects the long-established belief that Dickens quarrelled with his publishers, Bradbury and Evans, because they refused his request that they should print in Punch his "Personal" statement about his separation from his wife. It seems that he did not send them the statement but simply assumed they would reprint it from his own journal, Household Words, and was, quite irrationally, enraged when they did not. "In their different ways," Leary concludes, "both Dickens and Thackeray in 1858 chose to act as self-appointed policemen patrolling the boundaries of talk and print in order to manage and safeguard their reputations" and although they succeeded, the result in both cases was to damage the very reputations they were seeking to protect (109). Leary's last two chapters deal respectively with the astonishingly productive Shirley Brooks, who edited Punch for four years after Lemon's death, and with Bradbury and Evans, Punch's proprietors. Since, shortly before his death, Lemon had ousted Silver from Punch for some imagined "incivility," Leary can no longer draw on the extraordinarily vivid verbal record of Silver's diary. But through close study of Brooks's diaries as well as other sources, he is able to show that the new editor played a more dominant role than Lemon at the Wednesday dinners and that consequently, the resulting issues of the magazine were less the product of collaborative effort. The big cuts especially were very much the work of Brooks himself and Tenniel, with little input from others. Also, topping his already prodigious work in other fields, Brooks wrote more and more of the magazine's letterpress himself., His overwork undoubtedly contributed to his early death. He emerges from Leary's account as nearly heroic: not quite, perhaps, what Carlyle had envisioned years earlier when he defined "the Hero as Man of Letters," but nevertheless both phenomenal and admirable in his energy and output. In Leary's account, Brooks is the link between the old Punch of Mark Lemon and the far more "task-oriented and abstemious regime" of Francis Burnand (174), who rescued the magazine from the doldrums into which it had fallen during the ineffectual six-year editorship of the dramatist Tom Taylor. The chapter on Bradbury and Evans emphasises that, unlike Chapman and Hall and other leading publishers, they were printers rather than book-sellers. As Leary sees it, the key to their success with Punch was the close-knit and exclusive fellowship they established with their writers, centred on the Wednesday dinners and underpinned by their capital. They succeeded also as publishers of novels in monthly parts. But since Punch was founded on a personal and corporate loyalty among "a circle of talents," Bradbury and Evans found, to their cost, that they could neither replicate its success with a daily national newspaper like The Daily News nor succeed in making it the basis of their ill-fated journal Once A Week, founded after Dickens had pulled the plug on Household Words. An epilogue summarises the after-history of the Punch men following Brooks's death and contains some surprising information about the immense wealth that Silver left behind him and how he distributed it. Explaining in an appendix how later writers used his diary, which was left to Punch, Leary calls attention to the untrustworthiness of Arthur Adrian's selected transcriptions in his biography of Lemon (1966) as well as Price's in his A History of Punch. Since a full-scale edition of this unique record of mid-Victorian oral culture will probably never be undertaken, all scholars of the period have one more reason to be grateful to Professor Leary for this highly readable, scrupulously documented, well-illustrated and completely fascinating volume, which has just been most deservedly awarded the Robert and Vineta Colby Prize for the best contribution of the year to the study of Victorian periodicals. Michael Slater is Professor Emeritus of Victorian Literature at the University of London and a former Editor of The Dickensian. Among his publications have been Dickens and Women (1983), Douglas Jerrold 1803- 1857 (2002), and Charles Dickens (2009). He is currently working on a book called The Great Charles Dickens Scandal. Leave a comment on Michael Slater's review.